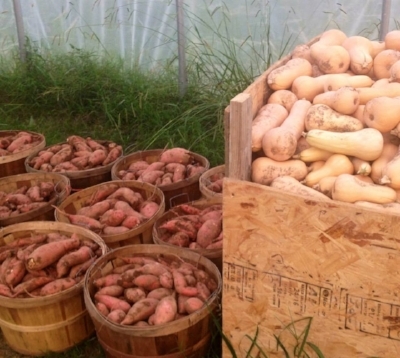 We grew an excellent crop of sweet potatoes and butternut squash this year and must find a home for them! These are some of the easiest crops to store in Tennessee and they have already been cured, which enhances their sweetness and storage quality. These make great gifts, additions to holiday meals, or a personal supply to eat through the cold months. This discounted bulk price is over 30% off the market cost of many items! Sweet potatoes are best stored a little cooler than room temperature, or anywhere between 55-70 degrees. A basement that stays above 55 degrees is an ideal place. If they get too cold, they will not taste as good. If kept in proper conditions, they may store into March and beyond. Butternuts prefer slightly colder storage temps (between 50-60 degrees) but generally do well stored alongside sweet potatoes. Relative humidity of about 70% is suitable for both crops. For our use on the farm, we store both in the kitchen pantry (room temp) and they tend to last for months. Both crops will be delivered unwashed, which makes them both store better and less expensive for you! Golden Nugget sweet potatoes are a personal favorite variety. It has a yellow flesh and more complex flavor than the classic type and has been grown in Tennessee for a long time. Deep Orange is similar to the classic types you may be more accustomed to. Both are excellent this year and well suited to a variety of dishes. Butternuts are a classic, organic Waltham variety. This year they have exceptionally sweet, dark orange flesh and have received high praise from our CSA members and chefs. 1. Place order at least 24 hours in advance of your chosen pick up time. Where will you pick up this order?